Ukraine's defence minister has accused Russia of launching a "great war" that could claim tens of thousands of lives. Russia dismissed the comments, saying they only pulled the Ukrainian people further into a bloody civil conflict. 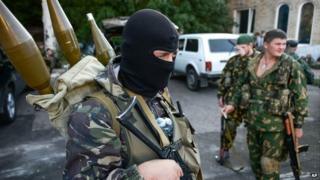 The comments came after Ukrainian troops were forced to flee Luhansk airport in the east of the country amid an offensive by pro-Russian rebels. Meanwhile, crisis talks between Ukraine officials, rebels and Russian envoys have broken up without agreement. "A great war has arrived at our doorstep - the likes of which Europe has not seen since World War Two," Ukrainian Defence Minister Valeriy Heletey wrote on Facebook on Monday. "Unfortunately, the losses in such a war will be measured not in the hundreds but thousands and tens of thousands," he added. Russia has repeatedly denied Ukrainian and Western accusations that it is providing troops and equipment to the rebels. Russia's foreign ministry said it was "hard to believe that such statements can be made by the defence minister of a civilised state". Meanwhile, UN Secretary General Ban Ki-moon said on Tuesday that there could be "no military solution" to the crisis in Ukraine. The situation was "very chaotic and dangerous" and required "a political dialogue for a political solution" that was sustainable, he told journalists during a visit to New Zealand. On Monday, Ukraine's army said it had been forced to withdraw from Luhansk airport after it was attacked by Russian tanks. Ukrainian President Petro Poroshenko said the incident was "direct, overt aggression against Ukraine from the neighbouring state". Media captionVladimir Putin tells the BBC the Minsk talks are "a very important process"
The retreat came amid a series of gains by pro-Russian rebels in both the Luhansk and Donetsk regions, and further south around the port of Mariupol. As many as 680 soldiers had been captured by rebels in recent clashes around Donetsk, according to state news agency UNIAN. A senior Ukrainian official told the AFP news agency that Russia's goal is to "destabilise [Ukraine] and create a land corridor to Crimea", the southern peninsula annexed by Russia in March. But Russian President Vladimir Putin said Europe was ignoring the Ukrainian military's "direct targeting" of civilians in eastern Ukraine. The latest round of crisis talks got underway in Belarus on Monday but after several hours of negotiations, they were adjourned until Friday. "This is just the beginning of the process," Andrei Purgin, a leader of the Donetsk People's Republic rebel group, told Russian TV. Rebel representatives are said to have softened their demand for full independence, telling Russian media they were seeking a "special status" for their regions within Ukraine. This would leave them in charge of security and give them amnesty from prosecution, while also recognising "deepening economic integration with Russia", the rebels said. Correspondents say their demands would mean the de facto division of the country, with the government in Kiev looking to secure closer economic ties with the EU. Russian Foreign Minister Sergey Lavrov, meanwhile, said he was counting on the talks to focus on "agreeing an immediate and unconditional ceasefire". Are you in Ukraine? How have you been affected by the current situation there? You can emails us at haveyoursay@bbc.co.uk to share your experiences with us. or use the form below to share your comments with us.